The Labor Law Information Poster is a general labor law poster poster by the Delaware Department Of Labor. This is a mandatory posting for all employers in Delaware, and businesses who fail to comply may be subject to fines or sanctions. This poster must be posted in a conspicuous place where all employees will see it. This poster describes the many different parts of labor laws. The parts described on this poster include payment of wages such as how often wages must be paid, what employers are required to notify employees of when they are hired, and what unlawful deductions are. Also described is everything an injured employee needs to get workers' compensation, what the minimum wage is for tipped and untipped workers and what the exceptions are to minimum wage, what to do if discriminated against in the workplace, how the state deals with breaks and the rules for child labor. DE All-In-One Labor Poster: Instead of printing out dozens of posters, employers can also purchase an all-in-one poster that covers both Delaware and Federal poster requirements by clicking here . It appears you don't have a PDF plugin for this browser. Please see the link below to download delaware-labor-law-poster.pdf. any changes in the day, hour or place of payment or beneﬁts. e paid at an hourly rate). Wages must be paid at least once each month. of each pay period [with some excep&#0;ons, see §1102(b)]. mail (only if requested by the employee). (upon the employee's wri&#0;en request). business establishment convenient to the workplace). 4 . Failure to return employer's property. the full minimum rate in &#0;ps. Tips may not be taken or retained by an employer except as required by law. 15% of the actual &#0;ps received by the employee. Employees in domes&#0;c service in or about private homes. Employees of the United States Government. Bona ﬁde execu&#0;ves, administrators, and professionals. Employees engaged in ﬁshing and ﬁsh processing at sea. amount paid for each employee for three (3) years. minutes if the employee is scheduled to work 7.5 or more hours per day. Must be a&#0;er the ﬁrst 2 hours of work and before the last 2 hours of work. employee wri&#0;en agreement which provides otherwise. Compliance would adversely aﬀect public safety. Only one (1) employee may perform the du&#0;es of a posi&#0;on. loca&#0;on (the excep&#0;on would only apply to that shi&#0;). compensated for their meal breaks. for appren&#0;ceship or training are covered by this law. employees, and every two years a&#0;er. reasonable accommoda&#0;on, can perform the essen&#0;al func&#0;ons of a job. would permit the employee to con&#0;nue working. The minimum age for employment is 14. A new Work Permit is required when a minor changes employers. Labor Day when the evening hour shall be extended to 9:00 p.m.
least thirty (30) consecu&#0;ve minutes. work period of at least thirty (30) consecu&#0;ve minutes. Labor Law Enforcement at any of the addresses listed. employer's obliga&#0;on to comply with any provisions of federal law. result in ﬁnes of up to $10,000 per viola&#0;on. There are an additional one optional and mandatory Delaware labor law posters that may be relevant to your business. Be sure to also print all relevant state labor law posters, as well as all mandatory federal labor law posters. 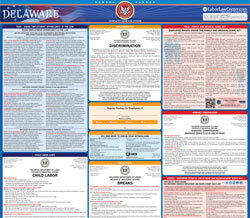 Instead of printing out pages of mandatory Delaware and Federal labor law posters, you can purchase a professional, laminated all-in-one labor law poster that guarantees compliance with all Delaware and federal posting requirements. Fully updated for 2019! While we do our best to keep our list of Delaware labor law posters up to date and complete, we cannot be held liable for errors or omissions. Is the poster on this page out-of-date or not working? Please let us know and we will fix it ASAP. LaborPosters.org will email you a printable PDF of this Delaware labor law poster, 100% FREE. You'll also get notified when new posters are available. Your Delaware poster has been downloaded and emailed! This poster download is provided as-is, with no warranty or guarantees. Please verify with Federal and Delaware authorities to confirm that you are posting all of the correct (and updated) posters required for your type of business. Instead of printing out pages of mandatory Delaware and Federal labor law posters, you can purchase a professional, laminated all-in-one labor poster.